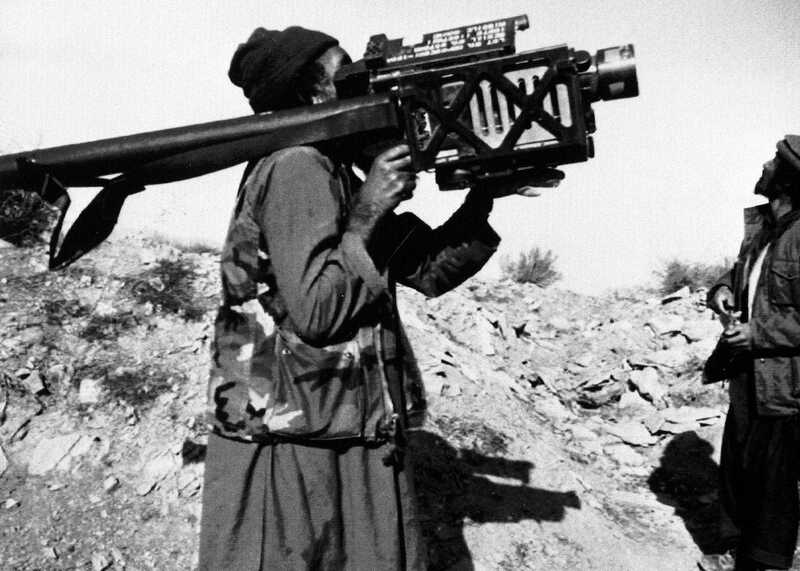 (AP Photo/David Stewart Smith)An Afghan guerrilla with a US-made Stinger anti-aircraft missile in this photo taken between November 1987 and January 1988. 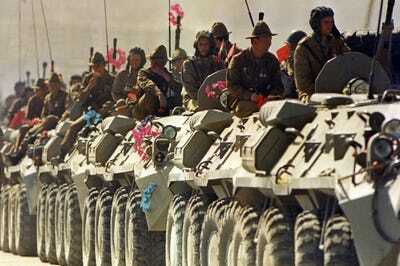 By the mid-1980s, the Soviet war in Afghanistan had reached something of a stalemate. To turn the tide, the US introduced Stinger anti-aircraft missiles to erode Soviet control of the air. In the years since, the Stingers and US policy in Afghanistan have become a headache, but CIA personnel involved in the Stinger program still see it as a success. With the decision from the White House, the task force grew and its budget swelled. But the program encountered a problem on the ground, where weapons and aid were supposed to cross the “zero line” from Pakistan into Afghanistan. “Despite the fact that we had now ample money and ample production, we weren’t able to move things across the border because the Hind helicopters for the Russians just basically nailed down and suppressed movement across the border,” Devine told Business Insider. To address that problem, some officials wanted to use the Stinger missile, which was still in development. The Stinger’s deployment wasn’t without controversy, however. There was resistance in the Reagan administration and within the CIA, Devine said. Nor was Pakistan’s president at the time, Mohammed Zia-ual-Haq, on board. US lawmakers were also uneasy with using the Stinger in Afghanistan, worried in part about sensitive technology falling into the hands of the Soviets. Milton Bearden, the CIA’s officer in Pakistan overseeing Afghan operations at the time, was asked to tell senators that the Soviet Union had years earlier gotten its hands on the Stinger through a source within NATO. 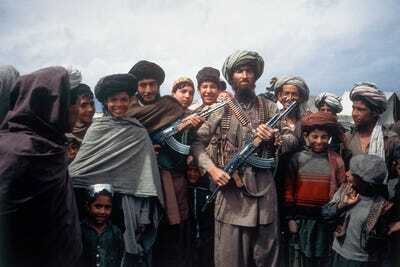 (AP Photo/Christopher Gunness)Mujahideen tribesmen at a border camp near Wana in Afghanistan, April 1984. An interagency meeting at the White House led to agreement to introduce the Stinger. A presidential memo followed, after which Devine was sent to procure the missiles from the military through a logistics officer. “It was my job to go and tell them, ‘Listen I want the Stingers coming off of the line.’ I gave him a number, which to the best of my knowledge is still not public … and he said, ‘You can’t have them. Our troops don’t have them yet,'” Devine said. “If I were in his shoes, I probably would have said the same thing,” he added. Three hundred were reportedly delivered in 1986, followed by 700 the next year – between 2,000 and 2,500 of the missiles were given away by the CIA during the war, according to journalist Steve Coll. US military officers provided training for the new missile. Pakistani officers trained in the US then returned to their country in the latter half of 1986, where they trained Afghan rebels. Reagan Library/Wikimedia CommonsPresident Ronald Reagan meeting with members of the Afghan mujahideen in the White House Oval Office in 1983. Other surface-to-air missiles the Afghan rebels used against the Soviets had to be guided to their targets, leaving the gunners exposed. But the Stinger was a heat-seeker – a “‘fire and forget’ missile that allowed a gunner to live and tell of his encounter with Soviet gunships,” Bearden and Risen wrote. By late September, members of the Afghan mujahideen who were approved for the Stinger – only “the best fighters,” Devine said – deployed on its first mission. On September 26, 1986, after a week of travelling, several dozen Afghan rebels with the missiles hunkered down near an air field used by Soviet forces outside of Jalalabad, in northeast Afghanistan. That afternoon, as a Soviet air patrol returned to base, they hoisted their Stingers to their shoulders, switching on the guidance systems and locking on to the heat signatures of the helicopters overhead. But the two other gunners each brought down a Soviet helicopter. Ghaffar reloaded and fired again, bringing down another. 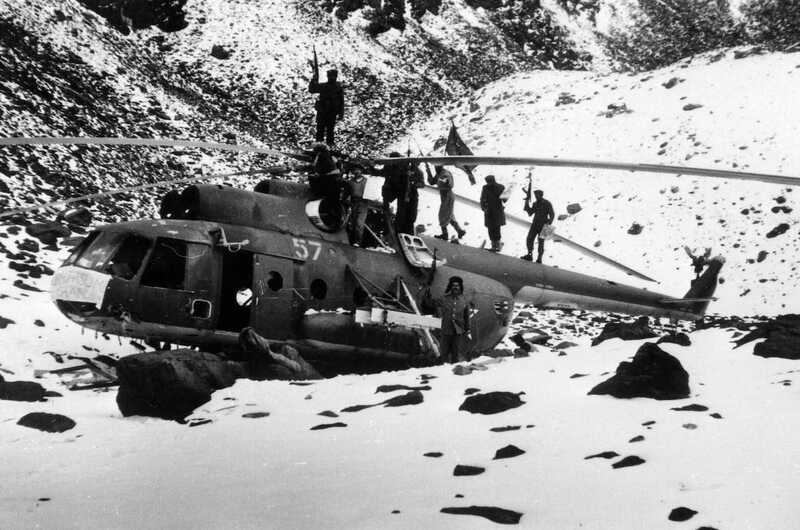 The Afghans broke radio silence for the first time in a week to report the kills, “sending the electrifying news of the first major victory against the Soviet helicopter fleet,” Bearden and Risen wrote. (AP Photo)Afghan guerrillas own a downed Soviet MI-24 helicopter gunship, near the Salang Highway, a vital supply route north from Kabul to the Soviet border. Picture released on January 12, 1981. News of the shoot-down “came back like a rocket,” Devine said. In a bit of luck, a satellite passed over just in time to get clear imagery of the scene. According to Bearden and Risen, a rebel swung his video camera around in celebration as the helicopters came down, mixing “wild shots of ground, dusty sandals, and sky” together in the footage. The Soviet response was immediate. The Soviet military adopted tactics to counter the new threat, including a new rule of thumb that 20,000 feet was now the safety altitude – about twice the ceiling of the Stinger, according to Bearden and Risen. 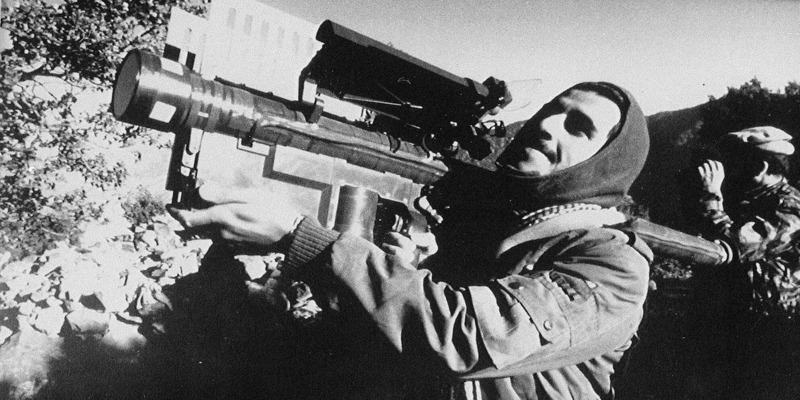 Soviet officials calculated that within the first year of its use, the Stinger had a success rate of 20%, up from about 3% when the rebels were using the SA-7 system, which was a Soviet copy of a much older US weapon. Nearly 270 aircraft were downed in total, according to one report. “At that point, that huge build-up of weapons … just poured across the border” into Afghanistan, he added. (AP Photo/ Liu Heung-Shing)Weary Soviet soldiers ride on armoured vehicles along a highway in Kabul heading for the Soviet Union in 1988. Within two years of that first successful Stinger strike, Russian forces began to pull out of Afghanistan, completing their withdrawal in February 1989, almost 10 years after invading. While touted as a game-changer, the Stinger’s effect on the battlefield and on Soviet leaders has been debated. Alan J. Kuperman, a political scientist and arms expert, has argued that Soviet leader Mikhail Gorbachev made the decision to withdraw prior to the Stinger’s first use and that Soviet countermeasures – such as flares and nighttime operations – negated the Stinger within a few months. Bearden has rebutted those arguments, citing evidence from US, Soviet, and Afghan sources. Devine, too, pointed to the introduction of the Stinger as a critical juncture. “We know now that the Russian military decided in aftermath of this that they were leaving,” he said, though he acknowledged that many factors led to that decision, including Soviet economic decline, budgetary issues, and political distaste for the campaign at home. 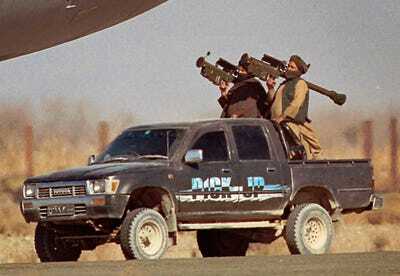 (AP Photo/Mir Wais)A mujahedeen rebel aims a US-made Stinger missile near Gardez, Afghanistan, December 1991. In addition to limiting who could get Stingers, the US required expended missiles be returned before new ones were issued. The missiles were kept “under pretty tight control,” Devine said. But the CIA still mounted a program to recover missiles after the Soviet withdrawal, with Congress authorizing $US65 million for buybacks in the early 1990s. Pakistani and US intelligence sources monitoring the effort told The Washington Post in 1994 that it had been plagued by failures, miscalculations, and wasted money. The sources said only a fraction of estimated 1,000 Stingers provided to rebels during the final years of the war had been recovered and that CIA did not know who had the rest. Officials involved in the distribution and monitoring of the missiles told The Post that the accounting system broke down as the war turned in the Afghans’ favour and the US increased the supply of missiles. “We were handing them out like lollipops,” a US intelligence official said at the time. (AP Photo/B.K. Bangash, File)Taliban soldiers, armed with US-made Stinger missiles, drive past a hijacked Indian Airlines plane at the Kandahar airport, December 30, 1999. Government officials said as many as 600 of the Stingers were still missing in 1996. In the decades since, there have been periodic concerns about Stingers and other shoulder-fired surface-to-air missiles being used against commercial aircraft. The US invasion of Afghanistan in 2001 again stirred concern the US-provided weapons could be used against American forces. At the start of that war, the Pentagon said the Taliban and Al Qaeda still had 200 to 300 of the missiles. US pilots in low-flying aircraft reported seeing surface-to-air missiles fired at them, but no US aircraft were downed by Stingers. 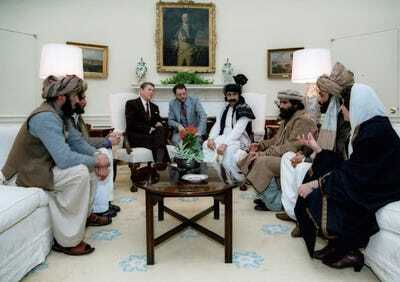 In 2010, Devine argued that a CIA-led cover-action program was the best approach for Afghanistan going forward, rather than an ongoing US military presence there, which he compared to the Soviet occupation. But muddled policies and failures on the ground in Afghanistan in the years since don’t detract from the agency’s victory over the Soviets in Afghanistan, Devine said.